I am struggling here with the modelling of prime and conventional mortgage losses. It matters because I am short Magic (see post). But it also matters to Fannie Mae et al. Anyway think about a pool of mortgages which is following historical seasoning patters. For very high quality mortgages loss would be peaking (at low levels) at about year three. Subprime mortgages which are following historic seasoning patterns have losses that peak earlier. Anyway – everything is tracking just fine – and then – for some reason the losses start ticking higher than predicted. Now you have to project what the ultimate losses will be. By definition here you do not know. The losses are higher than expected – and they are diverging from projection. I am going to use the fashionable baseball analogy to talk about stages of the credit crisis from the perspective of bank-uncertainty. First base: loans are turning sour at an increasing rate. They won’t get worse for ever (nothing does) – but they will get worse for an indeterminate amount of time. You have no real basis for estimating how long they are going to get worse for. You might remember the last credit cycle and (for your business) the deterioration lasted 15 months. So you model the losses assuming a “burn out period” of fifteen months. This is highly speculative and the confidence around your estimate will be low. You might think you know what is causing the sudden deterioration of credit vis trend. But you generally don’t. Your guess will be highly speculative too – though that will not stop media and pundits from speculating. If you were going to put an honest confident interval around your estimate it would be high. You can make investments on this basis – but you are shooting in the dark. Second base: the loans are getting worse still – but they are getting worse at a lower rate. The new entrants into the 30-59 day delinquency bucket are falling and the serious delinquency buckets are rising – albeit at a much reduced rate. At this point you begin to get some confidence about the end losses. Your estimate should get more accurate because you can now see the “burn-out” rather than just having to guess it. You might get one or two write-backs but they are rare and they look desperate. Third base: delinquency is falling across the board. The foreclosures are humming along – the courts have caught up with the reality on the ground for foreclosures and your estimates will be pretty accurate. You can still be wrong – but it is getting obvious by now what is going on. You even have enough loan files to work out what has gone wrong. [In stage one and two nobody really knows how much is fraud and how much is ordinary credit cycle.] Write-backs of losses are regularly occurring though are less frequent than further write-downs. Home: the economy has caught up – some buckets are actually improving. There is still a backlog of real estate owned, but the property price has stabilised. Your estimates should be pretty good now. Write backs are more frequent than write downs. And here is where the baseball analogy breaks down. Like baseball a lot of companies will be caught out (even insolvent) between bases. But unlike baseball you are never really home in this game. The economy could have a “double dip” recession – the so called W shaped recession. Certainty is not available. Anyway in this schema I am fairly capable of modelling the credit losses once we get to the second base – and I am totally incompetent to model the credit losses on the first base. That is just reality. We have no real idea what is going on yet. And at the moment we are clearly in the second base (or further) with respect to everything that was marketed as subprime 2006 and prior. If it is second lien marketed 2006 and prior we are probably in the third base because we know the loss severity too. (Loss severity = 100 percent!) And I feel pretty confident modelling it. I have even purchased a few stocks on that basis (notably Ambac which I have retained despite originally planning to sell some into the short squeeze). But with prime mortgages we are at the first base. They are getting worse in every bucket at an increasing rate. It won’t happen forever – but if someone tells you about a model of these loans you know they are just making the key assumptions up. Maybe they are making it up with an educated guess (such as my 15 month burn out period). But they are still making it up. And this is a problem for me because I have promised you an analysis of Fannie Mae’s credit losses – and I have also promised you that (at least on this blog) I will not make it up. And I am not sure I can keep both promises. I am short at least one stock because I guess the better part of their book will kill them. That stock is Magic. I think their subprime estimates are reasonable (though light) … but I sure that they do not have a handle on how the good parts of their book will behave and I am guessing the assumptions are optimistic. However as I promised you an analysis of Fannie’s credit losses and I promised you that I wouldn’t make it up I have to come to a solution. The solution: get you to make it up! 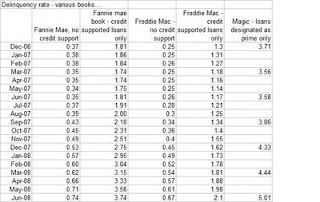 The two sequences all below 1% are Fannie and Freddie’s core book respectively. They are entirely mortgages below 80LTV and below the GSE threshold. This is the very best of the mortgage market. The books with secondary mortgage insurance are given in columns 2 and 4. It should be observed that the good end of the credit market did not deteriorate at all until August last year. This is clear across a lot of the data I look at. But it is pretty clear that this good stuff is getting worse at an accelerating rate. The last two months in particular have been bad. And for the reasons explained that makes it very difficult to estimate where this deterioration is going to finish. So – as I am not happy making it up can my readers have a go. What will be the delinquency for the insured and uninsured Fannie and Freddie books in twelve months? How about the Magic book? Guesses anyone? Email or (preferably) in the comments. All I can say: it ain't cricket! Facts? No, it sounds like you need a good anecdote. I'm bidding on a home that is about to be foreclosed on. The sellers owe $600k to IndyMac and $140k to Citibank. At the advice of my real estate agent, who both wants to see a sale and also keep me as I client, I'm offering $500k. The seller hasn't been paying property taxes. Citibank is getting $30k out of the deal (don't know why they're getting anything?). Indymac will get maybe $400k after all is said & done. Rinse & repeat, project, etc. There is a reason why Citigroup is getting something - and it should be the subject of another post. The second mortgage holder has the power to veto a short-sale - at least for a while. The FDIC (Indy Mac) is the loser. I don't want to make it up either, so I will let JP Morgan do it: prime losses are expected to triple in the next few quarters. Here is the transcript "
Can you elaborate more, you mentioned home equity might be a little bit better than you expected. You talked a lot about that at your Investor Day. But prime mortgage going from 48 basis points up to 91 basis points linked quarter, can you just elaborate more on what you're seeing there and why? Mike, it's exactly the same risk factors and all the other things. It's high CLTV, high LTV, it's stated income, it's California, Florida, Arizona. And I agree with you, they're staggering numbers. You know, it might be higher because, you know, we have all the politicians telling people it's okay not to pay your mortgages. It's just really hard for us to tell. Our current expectation is those losses could triple from here. And we're prepared for that, and we will reserve for that appropriately going forward. I'm sorry. Prime mortgage losses could go from 91 basis points to 270 basis points? Yes, that's what I said. We had $100 million a quarter, and we could go up to $300 million a quarter. We don't [expect it to] happen next quarter, but if you look at current trends - and maybe we're being a little overly conservative - that could be $300 million a quarter some time in '09. For awhile, not forever." Wow. Jamie Dimon said that. I just saw him on a charlie rose interview. So, let me ask everybody's opinion on the timing of buying a house in California. I guess it's not unlike the theme of this post... what inning are we in? How much worse can it get? year --- # of sales --- price per s.f. I'm buying a 2005 "peak-bubble" house. I guess I'll be paying $440/sq. foot. A few other peak bubble houses have already sold (same price). Am I getting screwed? Can you guys say some fancy economic stuff that will make me not want this fabulous little beach house that's only 600 yards away from one of my favorite surf spots? I am going to get back to JPM's comments in a later post - because to date it is the most public GUESS out there. But note that JPM is commenting on LOSSES not on delinquency. Delinquency leads losses and is the variable you focus on if you want to model. He thinks losses rise for several years - which means delinquency probably rises for two years. On the beach house. Go right ahead if you can afford it. It may be a lousy financial decision - but it can be a lovely CONSUMPTION decision. As long as you think of it as consumption you are thinking of it right. I can't talk - I purchased a house in Bronte near my favourite beach for about twice that per square foot. Buying property in Calif for anything above 96 price levels is strictly a lifestyle decision and one based on the knowledge that it probably will be worth significantly less maybe even up to 80% of it's peak price. I live in Sonoma Calif, have owned Ca RE since 76 and sold my last house in 2005 and currectly rent. When you graph this thing historically, at some point in the future, you can look back on the chart to this date and say this is where we were, and this is where we thought we were. Modeling the demolition derby would be a lot easier. Generally speaking, models use historic trends for their forecasting basis. So, we have an unprecedented economic, financial and geopolitical situation that is evolving today that nobody among us has ever seen. There is no historic parallel. Under these circumstances, modeling iterations based on any historic factors are, by definition, wrong. Even more so than all modeling. We are sailing in uncharted waters. Don't fixate too long on any of the traditional indicators.